The Curious Wavefunction: Feynman to Wolfram: "You have to extract yourself from the organization in order to run it"
Feynman to Wolfram: "You have to extract yourself from the organization in order to run it"
Feynman's point in #2 is worth noting and explains why it's not easy for someone with a scientific or technological vision to become head of their own company and why many scientists shun administration since it would mean a retreat from their favorite research; they would like to obey Feynman's admonition to have "as little technical contact with non-technical people as possible". However Wolfram himself is a happy counterexample since he was able to both conceive and run Wolfram Research and turn it into a profitable venture. The reason he could do was not only because he understood the science well but also because he was an astute entrepreneur and could understand the pulse of the market. 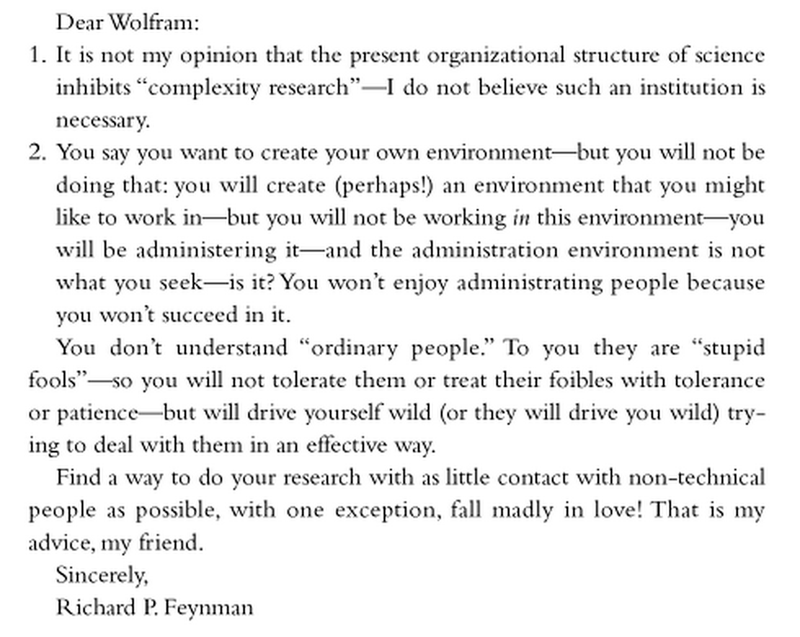 On a bigger note however, the point tells us why the familiar disdain that many scientists have for administrative work is also misplaced in some sense; even Feynman cannot escape noting the fact that you have to administer. It is not possible to run an industrial organization or even a purely scientific one based on technical vision alone. You must have an administrative plan that allows for few distractions and gives people the freedom they need to actually implement your vision. 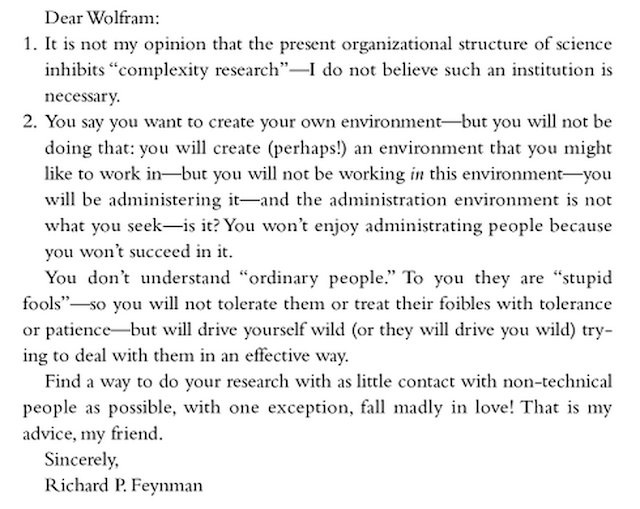 You should either implement this plan yourself (and risk falling into Feynman's black hole of misplaced action) or hire someone who can handle the business end without sacrificing your scientific vision. Most importantly though, you should hire people with a wide variety of backgrounds who still understand what you are trying to do and bring their eclectic training and enthusiasm to bear on the problem, and then you should give them complete freedom (within certain constraints and goals of course). In some sense you will be creating clones of yourself by giving them this freedom, at least as far as the scientific part of making an organization work is concerned. Some of the best scientific and technological organizations in history were based on this model. Two that immediately come to mind are Bell Labs which famously gathered a collection of Nobel Prizes while still creating breakthrough technological innovations and the MRC Laboratory of Molecular Biology which gathered even more Nobel Prizes for its researchers. The most famous director of the MRC was Max Perutz, himself a Nobel Laureate whose own work in solving the structure of hemoglobin was the culmination of fifteen years of dogged effort. Perutz brought a light but sure touch to the MRC while he was director. Afternoon tea was almost de rigeur and Nobel Laureate and postdoc chatted idly at the lunch table on a daily basis. A similar model was used by Robert Oppenheimer at the Institute for Advanced Study in Princeton, where "tea was where we explained to each other what we did not know." Perutz and Oppenheimer managed to implement the ideal scientific organization by minimizing that implementation. Sometimes you have to extract yourself from the organization to run it well. And if you do that you might even be able to fall madly in love with someone or something. We are all Hamiltonians. We are all Newtonians.